You can securely and permanently seal problematic areas/transitions between the carrier pipe and the underground. Given that elements are not attached mechanically but fixed with a particularly elastic glue, the forces produced by movements of the carrier pipes do not directly affect them. Their form allows for an absorption of the transferred tensions. Even heavy strain will not lead to cracks in the sealing elements or tensions at the glued spots (which could impair the fastening and lead to undermining). At the same time, the excellent adhesive characteristics of the glue provide an effective sealing against water. Only one step is needed to fasten and seal the elements. 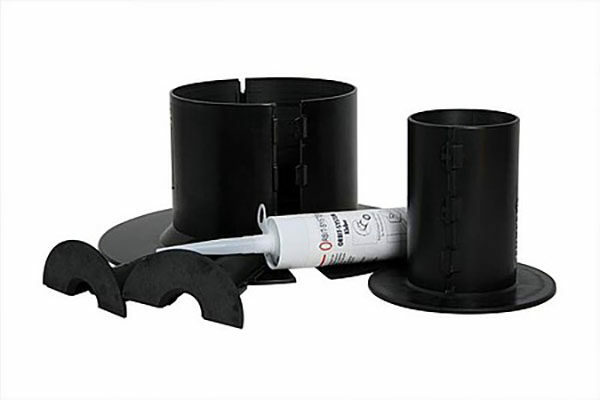 Another advantage of our product is that it can be attached to spots where water is damming (outside, on the sealing level) and so stop the water from entering the components in the first place. The outside installation of the our products elements (made of rigid plastic) offers additional security to the penetration, especially when ring seals are used. Shape and a visual inspection during the gluing procedure will prevent processing defects. Movements will be absorbed. The sealed spots will remain flexible, but are still secure and tight. A double sealing with two strips of glue each (> DN 100 three) will prevent undermining. The use of premium UV-resistant materials will guarantee a high mechanical capacity and a long life cycle. The special glue will set very well with concrete, brickwork, etc.